Life in Moscow is fun – but let’s face it, you only get to fully appreciate it when you leave now and then for a few days relaxation somewhere else. During the holidays, expats enjoy leaving the country, to sniff a bit of different air than Moscow’s, in order to return freshly recovered and fit for another round of Russia. What about weekends or short holidays? If you are not among the lucky ones who owns a dacha, or has nice friends who take you to theirs, you still can leave the city and even explore other parts of Russia and that only for a quick weekend trip. How you travel is your choice. Of course there is the good old car, which has the obvious advantage of being rather flexible and can be stuffed with all the things you need for your short holiday. However our car is more of an adventure itself – an old Niva – to which I might dedicate another blog. I can strongly recommend travelling by train. You can enjoy the beautiful scenery and a compartment can be quite cozy with good company. Some Russians take a bottle of something on their journeys to calm their nerves – especially when flying. During a recent six-hour delay at Domodedovo airport, the employees of an Austrian low cost carrier implored a Russian traveler not get too drunk during the wait, otherwise he could be denied his flight to Vienna. In any case hard liquor has been recently banned from airports due to Medvedev’s anti-alcohol campaign—although you can still buy it in duty free shops. Travelling by plane has its obvious advantages, and low-cost carriers have been providing service to Russia for some time now. Avianova and Skyexpress are two of the biggest ones and I have had some fun experiences with both of them. Avianova’s credit card payment didn’t like the fact that my surname has only 3 letters and wouldn’t let me pay online. Skyexpress requires a credit card account denominated in Russian rubles in order to pay online, but it also offers the option of paying in cash at special terminals that are located in mobile phone shops. However, it is not always easy to find one of these terminals when you need it. Of course there is also good old Aeroflot. If you book last minute this can be the best option anyways (you can collect SkyTeam miles with them after all). Air travel in Russia is enjoyable. The planes are pretty new and you get to see all the exiting provincial airports that to my eye look nearly the same in every region. You will not find any Wolfgang Puck restaurant, Starbucks or McDonalds in those regional airports (if you do, please inform me immediately please!!) but very interesting Soviet-style buffets that sell sandwiches that are worth a try (they really taste better than they look!) A little trick how to get from the airport to the city - do it like my boyfriend. Be social, get to know people on the plane and ask how much a taxi costs in order not to get ripped off. And if you’re lucky, you are offered a ride and even become friends with the person next to you on the plane. Since our trip to Kazan, my boyfriend has a new banya friend thanks to his openness on board. Accommodation can be found via the Internet. Often there are mini-hotels, apartments or even regular hotels (even 4 stars) that are affordable, because they are located in the regions (for example, you can get a room in the Grand Hotel Kazan for about 4,000 rubles). The best option however is locating some old friends or relatives, then you can expect even a free tour around the city. #1: St. Petersburg, perfect for a weekend or some days and especially comfortable (but not that cheap), reachable by SAPSAN in about4.5 hours, a high speed train connecting Moscow and St. Petersburg. You can save the train ride or car ride in traffic to the airport since the train leaves from the Leningrad Railway Station. As an alternative you can try the overnight train – done both, liked both. 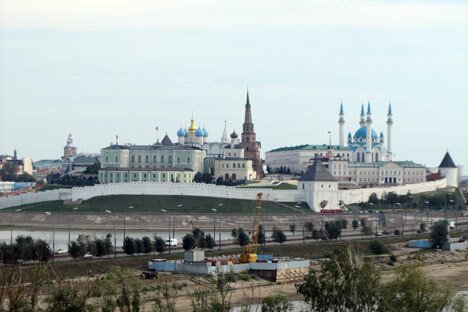 #2: Kazan (Tatarstan), quite nice city with oriental touch, reachable by Avianova or by overnight train from the Kazan Railway Station. GrandHotel Kazan is a good option for rooms and it has a 24-hour bar. Had the weirdest experience with a Chinese restaurant there (Chinese food interpreted the Russian way with some soviet-eastern decoration) – just stick too local cuisine. Wonderful mosque and interesting Aqua park. #3: Tyumen, close to Yekaterinburg, about 2 hours flight from Moscow. City center reminds of an amusement park for kids, with ferris wheel, clean and well kept city. Catch a car for 300 rubles to Verchny Bor, the thermal springs, which are located a few kilometers outside the city. Tobolsk is a city about 200 kilometers from Tyumen with a nice kremlin and the home-village of Rasputin on the way (but otherwise not really worth the trip). #4:Taganrog, a small city close to Rostov-on-Don. Reachable via commuter train (elektrichka) (beautiful seaside view) or fixed0-route taxi (marshrutka) from Rostov-on-Don, nice beach and lovely city. People are very relaxed, open and friendly. Tip: In summer they have great tomatoes. What about Russians? They recently seem to prefer shopping trips to Europe. On my short trips to Vienna (consulate related) I notice more and more Russians flying to Vienna (my hometown), loaded with shopping bags on their way back to Moscow, some clapping during landing in Vienna (happy to be out of Russia) and in Moscow (happy to be back in their motherland). While I was in Vienna for the Christmas holidays, surrounded by Russians, I missed Moscow a little less than usual.